Nowadays all we seem to hear about is ‘going green’ and how to be more energy efficient. Well the reason we’re hearing so much about it is because it’s a very important subject and if we don’t all act pretty fast our future generations are going to be left picking up the pieces. One of the most crucial ways to be more carbon neutral is by saving electricity consumption where you can. etech have the knowhow and expertise to advise you and provide cost effective energy efficiency solutions to suit you. 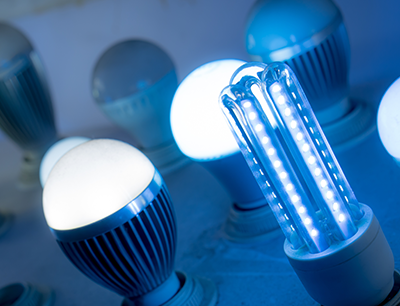 You may want to retrofit some of your lamps with LED equivalents saving you up to 90% of your lighting consumption costs and removing the need for costly lamp replacements saving you money long term. Or maybe you are interested in having a voltage optimisation unit installed in your home or office which transforms your incoming supply voltage to a safe and usable lower voltage (Typically 210v-220v) and ultimately means your appliances and equipment use less power to run. Or maybe you are even considering an upgrade to your existing heating system. A fully electric, economy tariffed system could be the answer to saving those much needed extra pennies while achieving increased and more efficient control over your heating times and temperatures. We can survey your premises and submit a free energy consumption analysis with a no obligation quotation and action plan to meet your energy efficiency goals. With competitive, free, no obligation quotations on request you can be sure you know where you stand with us. Call us on 01823 322 446 to find out more. © 2017 Etech. All rights reserved.